I've often thought that an easy way to measure the warmest point in any given room, when you don't have a thermometer handy, is to allow a cat into the room and watch where it settles. As the weather has been getting colder, Cleo has taken to giving herself a little cat sauna when the heating comes on. 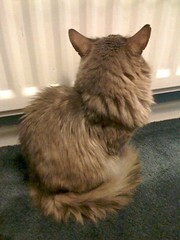 She sits side-on to the radiator in the bedroom, her left flank touching the surface, then turns her head towards it, so that her nose is only a few millimetres from the hot metal, as you can see in this photo. The radiator is really hot to the touch, but her fur seems to insulate her sufficiently, and she just sits there quietly, soaking up the heat with her eyes closed. Once she's reached optimum temperature, she curls up on the bed and goes to sleep, thus adding to the tog rating of our duvet by donating a generous coating of her fluff. When the heating is on (morning and evening), our house stays at about 18-20°C, so it's hardly cold. Even when it's off, the insulation is good enough that it doesn't drop much below 16°C. Still, I'm sure if Cleo could operate the thermostat, it would be closer to 35°C, and hang the consequences for the environment and our bank balance.